Pale gums can indicate a kitty who's feeling under-the-weather. Gum color may seem like an obscure health concern, but it can be a tell-tale sign of your purr-fect companion's state of health. Felines have a habit of being very quiet and under the radar when they're not feeling well, and checking your furry friend's gum color might be her saving grace. Healthy kitties will exhibit gums that are pink in color. Pale gums can appear very light pink or whitish in color. White, blue or yellow gums all can indicate serious health concerns. Any change of gum color or loss of color in Kitty's gums requires immediate veterinary care, as this can mean loss of blood, "shock" and a low white blood cell count. These serious conditions can be life-threatening for your feline friend. Some kitties have gums that may be speckled or pigmented with colors, such as black and grey, which make it hard to tell if her gums actually are the healthy pink color they should be. In this case, lowering her eyelids gently will allow you to examine another mucous membrane that will help to indicate whether everything is working properly. If the inner eyelid looks pale and lacks a pinkish color, she is need of veterinary care. Kitty's veterinarian often will use a test known as the capillary refill time to measure how well her circulation is working. When pressure is applied gently to kitty's gums, the area should blanch and then return shortly to a healthy pink color in only 1 to 2 seconds. Less than 1 second or over 3 seconds is cause for concern, and immediate veterinary attention is recommended in this case. Kitty has the uncanny ability to hide from her human friends whether she just isn't feeling well at all. She can do this for lengthy periods of time and then it's too late. After being treated by a veterinarian and sent home to be where she loves to be most -- with you, of course -- one way to aid in monitoring her state of heath is to keep a close eye on her gum color. Feline immunodeficiency virus (FIV) is one serious condition that the capillary refill time can help to monitor. 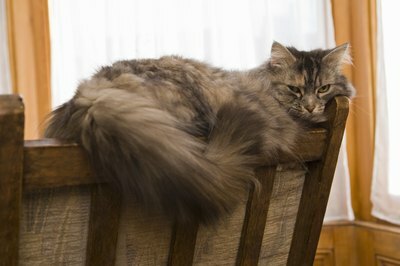 Pet Place: What is Normal in Cats? Can Gum Disease in Cats Cause Lethargy? What Causes a Variation in Color in Siamese Cats?